I had the privilege to speak for some wonderful servicemen and servicewomen at the Fleet and Family Support Center on the Coronado Naval Base. Here is the SlideShare from myÂ presentation “Online Marketing & More” with notes listed below. Who already has a business? Who has a website for it? I recently presented “Customizing WordPress Themes” at the local San Diego Word Press user group run by Glenn Bradley. The talk was on how to include jQuery into your own WordPress themes. The slideshare presentation probably makes great reference notes for those in attendance but not so much for those who are viewing it as a standalone document. Slide 1: Really simple, WordPress is awesome for blogs, basic sites, and brochure type sites. They are able to be themed and implemented relatively quickly. I like them much more than static HTML sites. No more wondering which version of content is the latest. Slide 2: We’ve all spent way too much time looking through free themes on WordPress. There never exactly what you need or they cost too much. Template Monster is nice but frankly, when I’m working on my own theme I don’t want to spend a dime so I just wrangles WP’s twenty ten theme into my own custom themes as needed. Slide 3: Most people using WordPress should know, changing the theme within WordPress admin is under Appearance > Themes section. In hosting the WordPress theme is under domain.com/wp-content/themes/name of them folder. Simply upload the theme into the directory and choose it within the admin themes section. Slide 4: One really cool thing about WordPress themes is you can create multiple page templates and select which theme you want to use within your WordPress page. Slide 5: A few examples of WordPress themes using jQuery image sliders were used in this presentation. Three of the four sites are live at the time of this blog post. Pro Restaurant Design is a recent site I launched targeting owners of restaurants. This WordPress theme is uses the Anything Slider. San Diego Sport and Spine uses Auto Image Rotator and Mindful Design uses Avia Slider. Slide 6: There are a ton of sliders out there, including WordPress plugins using jQuery, MooTools, and Script.aculo.us. Finding one that fits you or your client’s needs isn’t easy as it seems. Searching for terms like jQuery Image Slider usually yields decent results. Slide 8: When customizing your own theme, start from the basics. Make sure you know where your blocks of content go before you start CSS’ing and DIV’ing them out. 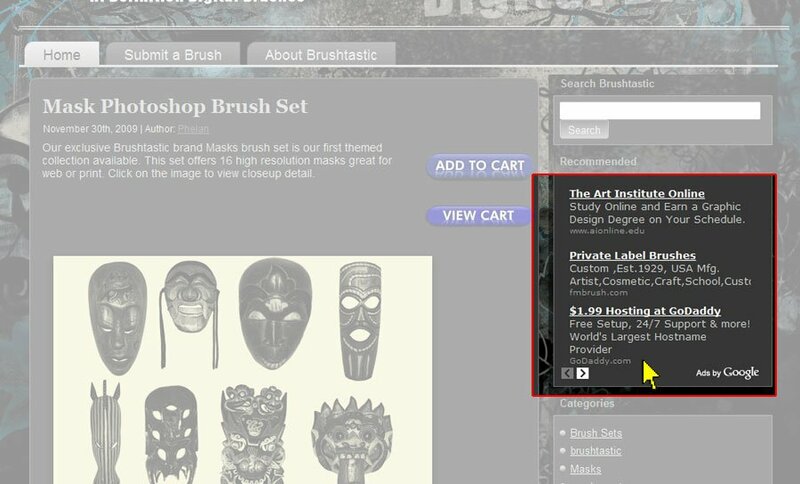 Wireframe your site layout first. Slide 10: There are several files you need to consider when themeing WordPress templates. They are index.php, page.php, and single.php are the main ones, then archive, search etc. are also needed to be themed. Get your main pages in order first then you can update the others later. Slide 11: The standard index.php file from the Twenty Ten theme uses the get_header () ;Â call. Slide 12: Change get_header () ; to get_header (home) ; and it will call the header-home.php file instead. In this file (header-home.php) you can modify the contents within the <head> area and add your specific .js files accordingly. Slide 13: On any other page templates, all you’ll need to do is grab the dynamic content and wrap the CSS around it. Slide 14: Customizing Widgets is easy. Just add this first set of code wherever you want the widget to show up on your site. Open up the functions.php file. Copy and paste the existing widget code, rename every instance of primary-widget-area and respective text to something you’ll recognize later and you should have a function custom named widget in your admin > appearance > widgets section as well as you page template. Slide 15: Going back to the header file(s), simply add the code from your jQuery script. Best way is to grab it from the demo, strip out all unnecessary code and make sure it works on a static file, then migrate it over to your WordPress theme. Makes sure to comment code out everything as best as possible. Slide 16: Using one of the HiFi, Page.ly Multi-edit, or More Fields plugins are a great way to get content on a page. Specifically HiFi will allow for scripts, CSS and other code to be injected into the header or footer files. Multi-edit and More Fields almost act like widgets. You can add content through the page admin area. You’ll have to find the correct snippet of code into the template though otherwise they won’t work at all. HeadCleaner helps clean up some of the code in case something breaks. Sometimes it works, sometimes not. Slide 17: Use Firebug! What else can I say. Learn it, use it, love it. Slide 19: Conclusion…know CSS otherwise custom themeing won’t be fun. Test all pages like the search page, archives page and 404 pages and make sure to cross browser check your CSS including making sure you’re w3 compliant. AT&T has been sending me relentless amounts of AT&T U-verse letters in the mail without any opt-out addresses to respond to. 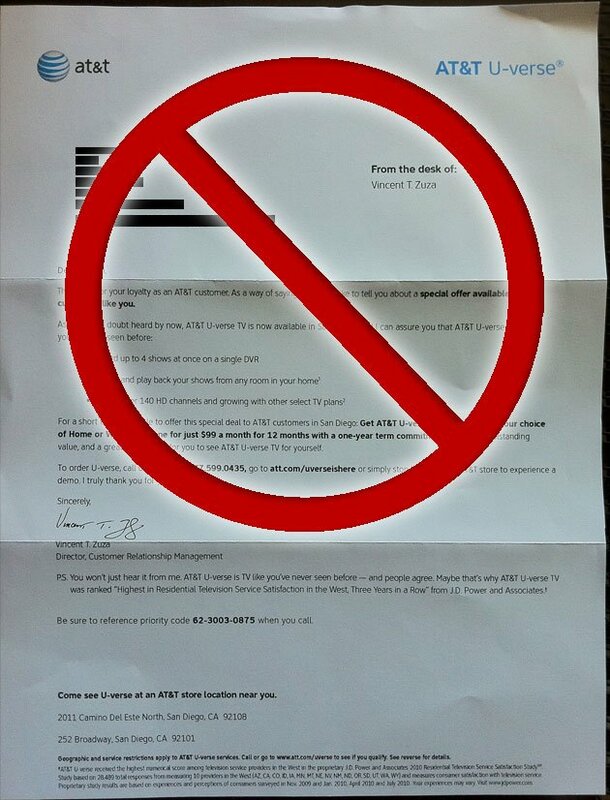 After a quick search on the Interwebs, I found this post on how to opt out of AT&T’s mailers. Although the post had some great information I still don’t think it should be this hard to opt-out. While we will strive to honor your request, you may receive an occasional mailing. To the extent that you receive unwanted U.S. Mail from any source, it is hoped you can make it available to a paper recycling program. Thank you for providing the requested information. Your request for Do-Not-Mail has been submitted for AT&T. Please allow up to 30 business days for the process to complete. Kudos to AT&T for having a process to get names and addresses removed from their mail list, but seriously it shouldn’t be this difficult. In this day and age of automation this process should be much much easier. You've created a website with tons of seemingly related content and you're now looking to make your next million in related ad revenue through Google AdSense. But look, your Google ads are showing unrelated ads that no one will click on. 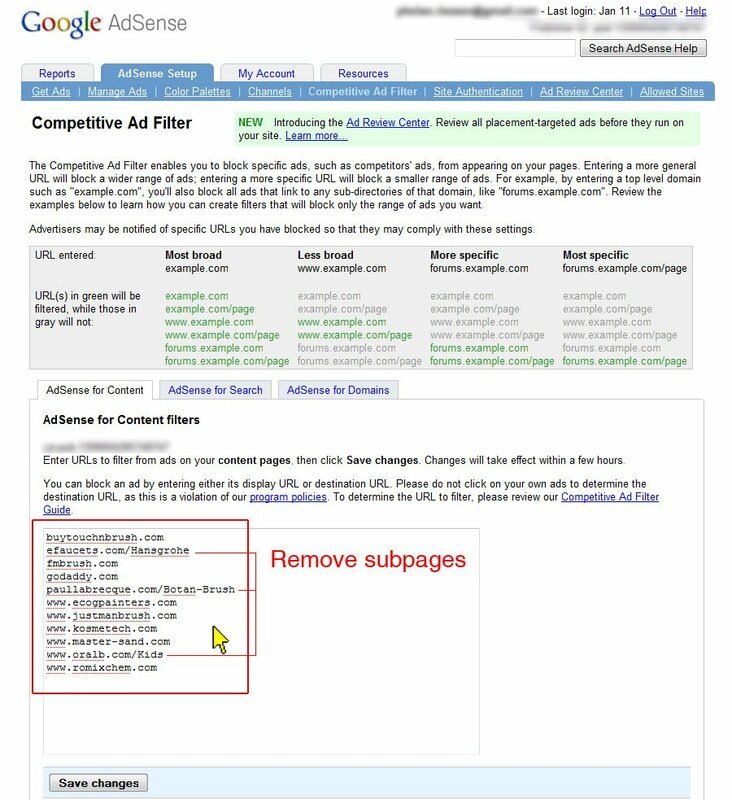 Here's the basic rundown on how to Remove Unwanted Ads from Google AdSense. 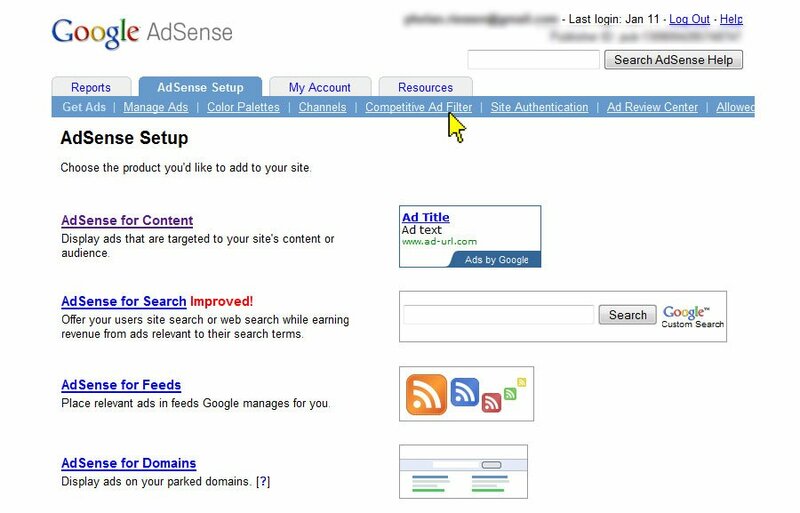 Login into your Google AdSense account. Click AdSense Setup in the top tab. Click on Competitive Ad Filter. Go to your own website and copy and paste all the URL addresses to remove from your webpage. For instance Godaddy ads seem to appear everywhere. I suggest copying and pasting all of them into NotePad. Enter URLs to filter from ads on your content pages, then click Save changes. Changes may not take effect until up to a few hours. Make sure you remove subpages or sub domains from the links and just input root domains if you want to eliminate the advertiser all together. Check back to your website after the changes have been updated within the Google AdSense system. There might be more ads you need to remove. This can be an ongoing process, but keep trying anyway. Do you have connections in your social network that always take but never give back? Are they always spouting off endless and useless information? Do they set their microblogs on auto post 24 hours a day but never take a break so they can simply gain followers? You're not alone. Recently I got fed up with a contact I had helped out in the past. I extended my hand in friendship but the friendship and favors were hardly reciprocated. I tried and tried again over the course of a couple of years but I just wasn't feeling the love so I finally gave in. Thanks to Dave Taylor's post on how to delete a contact in LinkedIn, I was able to remove the connection. Dave's post was slightly dated and partially confusing so I decided to repost with an easier "how to" remove connections on LinkedIn. Login to your LinkedIn account. You will be directed to the LinkedIn dashboard. In the center area on the navigation, click on Contacts and then My Connections from the drop down menu. Once you're on the Contacts page, you should see the Remove Connections link on the right side. Click on it and it will take you to the Remove Connections page. Use the vertical alphabetical navigation on the left side of the Remove Connections list. Locate the connection you want to remove. Select the check box next to it. Click on the blue button on the right side Remove Connections. Final step, there will be a pop up window confirming you want to remove the LinkedIn connection. Click on the blue Yes, remove them button and you're done! Now go enjoy some peace and quiet without someone auto posting 20 times per hour.